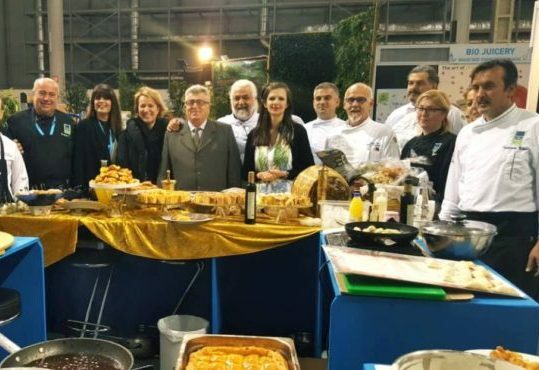 As part of the programme of events for South Aegean, European Region of Gastronomy 2019, a special showcase of the region’s gastronomy and culture was conducted at the 2018 EXPOTROF food and drink expo at the Athens Olympic Fencing Center 26-29 January. Visitors and professionals were treated to a wide range of traditional products by Aegean locals, which captured the gastronomy, heritage and culture at the heart of IGCAT’s European Region of Gastronomy platform. Further excitement was caused by a thematic event on Saturday morning, which emphasised how the South Aegean region is now uniquely placed to exploit two recent trends in global sustainable tourism. The two trends discussed were the increasing preference for experiential gastronomic tourism, coupled with a rise in nutritional awareness among modern tourists and locals alike. Roberta Garibaldi, Associate Professor at the University of Bergamo and certified Ambassador of the International Association of Gastronomic Tourism, participated in the meeting and presented the current international trends in gastronomic tourism. In her speech, she highlighted the great dynamics growing internationally in this field, referring to the increasing number of tourists choosing their holiday destination based on its gastronomy. This rise has materialised, according to Prof. Garibaldi, in the context of increasingly popular experiential tourism, an area in which the South Aegean Region is uniquely well placed to exploit and flourish in. Glykeria Psarra, a PhD Scientific Associate at Harokopio University and Assistant Professor at Rutgers University, focused her presentation on proposing the Aegean diet as a healthy nutritional model. Dr Psarra was keen to highlight the Hippocratic concept of the Diet, emphasising the important role of physical exercise in stimulating overall dietary change. Dr Psarra concluded that the peculiarities of the local climate, crops and soil morphology complement the image of the Aegean Diet, offering to those who follow it, multiple benefits for their mental and physical health. Incentivise and motivate young people to return to traditional land cultivation and to educate producers on new technologies.